Cocotte Equipment presented Frida – an ultra-small, yet highly versatile tablet messenger bag big enough to provide shelter to any Apple tablet including iPad, iPad 2, and the new iPad. Despite its small size the new bag will protect the contents from everyday impacts and still offer enough space to fit various accessories. The new iPad case features separately sewn waterproof lining, ensuring not one drop of water reaches the tablet inside. The bag is fully reversible, which means it can be worn as you please: either on left or right shoulder. 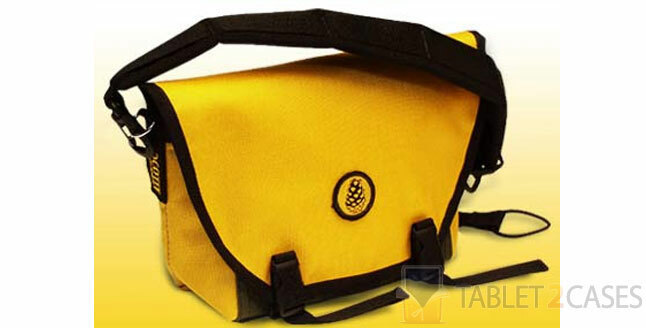 The comfy padded shoulder strap offers great mobile convenience and can be adjusted in seconds. The new Apple iPad 2 case features compression straps, which allow easy size adaptation to contents. A large interior pocket comes with a pen compartment. Sternum strap is included to assist in stabilization of the new bag. The back of the new case is padded offering great comfort. The bottom is 4 ply re-enforced to increase durability. The price for this case is $76.